A reseller agreement is made between two parties where one party agrees to sell, market, distribute or lease a product on the other party’s behalf, on certain terms and conditions. The agreement sets out these terms and conditions. A reseller agreement will typically also state that the product manufacturer retains rights to his or her intellectual property. 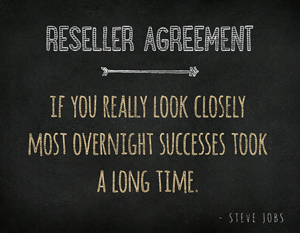 A well-drafted written reseller agreement helps establish a relationship built upon fairness and mutual benefit. Contact our corporate attorneys to assist in the drafting of a reseller agreement to minimize the risk of disputes between parties and costs involved with resolving disputes. Reseller agreements are valuable in the development of the relationship between the reseller/distributor and supplier/manufacturer. A well-drafted written agreement helps establish a relationship built upon fairness and mutual benefit. Contact our Chicago business attorney to assist in the drafting of a reseller agreement to minimize the risk of disputes between parties and costs involved with resolving disputes. We will ensure your interests are well represented and the agreement will harness a strong relationship between the parties.